I finally broke down and let my little brother duo queue with me. It’s actually a high risk because I feel like being in a duo queue lowers your chance at winning. However, this wasn’t a standard duo queue, this was a duo party, because I had the PartyPooper. I figured that PartyPooper would play top lane because that’s what he usually does. His mains are champions like Lee Sin, Rengar, and Xin Zhao. However, because we were the last two picks in the game I didn’t know how things would go. We ended up choosing between Support and Mid. PartyPooper promptly volunteered for Support. I asked if he wanted to play as Lee Sin because the enemy mid lane was Lux. He said no thanks and then picked Janna. At least I got last pick, so I knew what I would be up against. I think Lux is a fine pick. Fine until she gets matched up against higher damage output. The changes they made to LeBlanc affected her level one in a negative manner. The changes also turn her into a complete monster at level two and three. I could almost guarantee a kill or at least completely zoning a lane if I know where the jungler is. Tryndamere beat me to first blood in this game. He can fight at level one, and LeBlanc can’t do that and expect to win. If Tryndamere has 35% chance to crit he can expect to win his lane trading auto attacks with the enemy top laner. This game was wild. I had Warwick use his ultimate on me a number of times, only to witness me walk away from him later. I did have a couple nasty encounters with Lux laser. Luckily, I was recording so you can see that the laser clearly misses me, and yet I still die from its damage. What’s up with that, Riot? If you didn’t have at least four deaths this game then you really weren’t part of the party club. Caitlyn didn’t like to party. She did like to eat the enemy bot lane alive. Her only death was completely my fault. Her and I were diving the enemy Graves under his turret. She went from behind and tanked turret. When I stepped in to nuke him I saw that I was getting flanked and just had to turn and run. Caitlyn got surrounded after tanking turret fire and died. She told me thank you after that, I must have taught her a valuable lesson in trust. Or something else. I qualified for a series! I checked my MMR tonight using http://op.gg/mmr and entering my account name. Its response was very gracious. It felt like I deserved to be leagues higher than I am currently in. It said my hidden score was 1,785. Not bad! PartyPooper’s score was close with an 1836. I can’t believe that I’m only 51 points behind someone a full division ahead of me. Maybe division isn’t the right term, but I’m in Gold II and he’s in Platinum II. Now you understand the concept I was trying to convey! 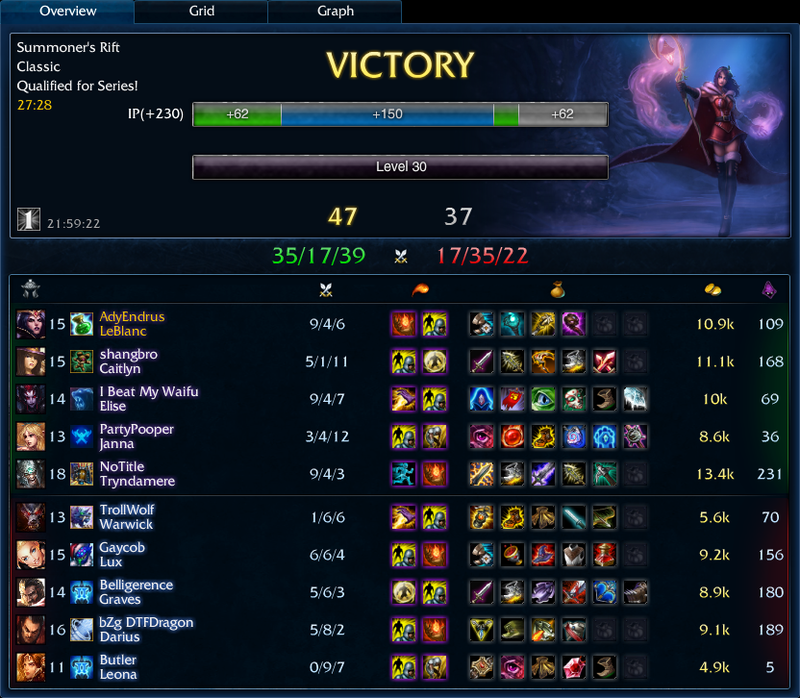 This game ended when Tryndamere got finished build and Janna’s killing spree was ended. Also, Warwick’s name… almost made me want to report him.